Jennifer Walczak, 29, 5’5″, from Bowmansville, N.Y. I was no stranger to overindulging; I routinely scarfed down wings and pizza during family takeout nights. I knew I was overweight, but in all honesty, my attempts to cut out unhealthy foods were halfhearted. That is, until my 2011 Florida vacation. After a week of cheesy, fried fare, not even my stretch leggings fit. On the flight home, the elastic band dug into my waist as I sat in a seat I’d had to squeeze myself into. I was mortified—even more so when I got home and realized I weighed 215 pounds. I could no longer ignore my poor eating choices, so I signed up for Weight Watchers. The program’s point system made planning healthy, portion-controlled meals (like chicken and veggie rice bowls) easy. I also became obsessed with the support I got at each weigh-in. Knowing the staff was so invested in my progress motivated me to work harder. My other strategy: enlisting the help of a friend to get me to the gym. On our first trip, the initial 10 minutes on the elliptical left me out of breath and convinced that exercise wouldn’t even help me. But with her encouragement—and a water break—I pushed through to 25 minutes that day. By the end of the second week, I had ditched 7 pounds. Soon I began experimenting with different gym classes to keep things interesting. I continued eating well and added 20 minutes of HIIT workouts daily. Eight months later, I had shed another 35 pounds, and friends from high school began to notice my progress. These days, I’m 68 pounds lighter and the person my co-workers and friends come to when they want to get back on track themselves. 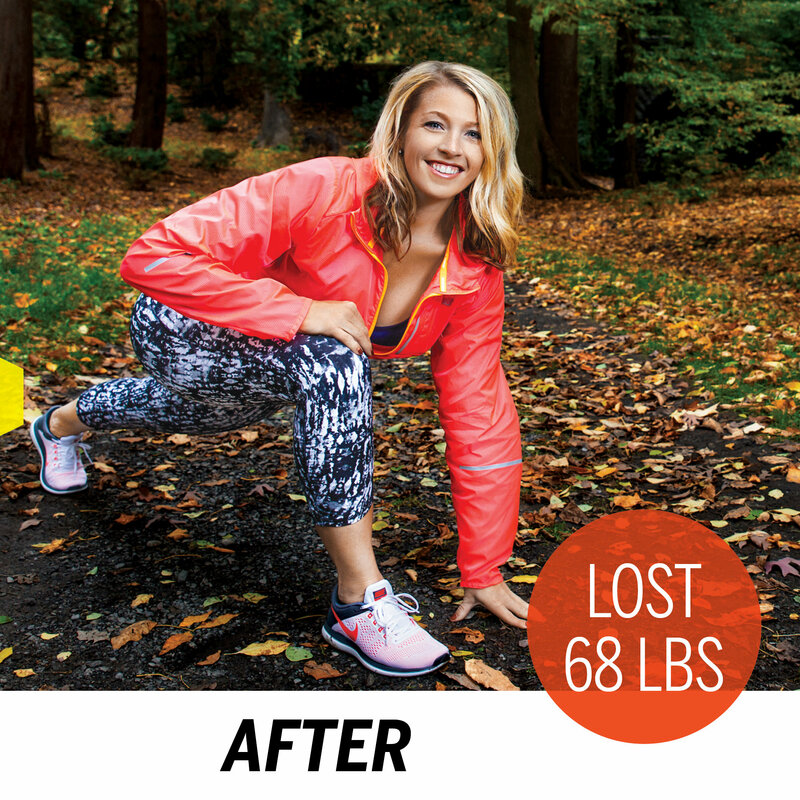 I love that my story inspires the people I care about to live their healthiest lives. Excuse-proof your morning: Getting out the door for my 5:30 a.m. workout isn’t always easy. I lay out my workout clothes the night before so I have one less barrier between me and my favorite part of the day—exercising. Pack in protein: I love pancakes, but the full-fat version made with butter isn’t that healthy. I do 1/4 cup of oats, a mashed banana, an egg white, blueberries, and half a scoop of chocolate protein powder. It’s just as satisfying and twice as filling! Have an active commute: I live a mile and a half away from my office, so every day, I walk to and from work with a co-worker. It’s a simple way to sneak in exercise, and doing it with a friend keeps us both motivated. Jennifer’s wearing: New Balance running jacket ($120, kohls.com), Gaiam yoga capri leggings ($45, kohls.com), and Nike women’s running shoes ($80; kohls.com).